Effectively heats 1,000 to 2,000 sq. ft. This PelletVent Pro Horizontal Venting Kit by Dura-Vent contains everything you need to complete your installation and is suitable to use with 3 in. PelletVent Pro vent pipes. These pipes and components are laser welded, double wall pipe with an inner wall of .012 in. stainless steel and a .018 in. laser welded galvalume outer wall. You can purchase the pipes and kit in a painted black exterior if needed, and this venting kits comes with a limited warranty. This kit provides the components needed to finish the installation of a vertically vented 3" PelletVent Pro pipe system through a cathedral ceiling. The kit includes the cathedral ceiling support box, a black appliance adaptor, the adjustable roof flashing, a storm collar, and a vertical rain cap to keep rain out of the vent. The PelletVent Pro system is suitable for venting corn and pellet-fueled stoves and inserts. The parts in this kit come with a limited lifetime warranty. Our Dura-Vent Ceiling Kit is the perfect addition to your stove or appliance than burns wood pellets or oil fuel. You can easily self-install this ready to install kit supplied with everything that you need. This not only saves you the hassle of having to go out and buy the individual parts but is also cheaper than if you would have to do so. The 3-inch inner diameter fits neatly through a flat ceiling to provide safe ventilation. Does your stove or insert use wood pellet or oil fuel? This handy appliance adaptor connects most pellet and corn appliances to PelletVent Pro Vent Pipe with ease! It is appropriate for both vertical or horizontal installations, leaving your options open. The appliance adaptor features a 3" pipe opening, and a modern galvalume finish. It boasts easy connection to flue collars, and even comes with a limited lifetime warranty. Please allow a 1" clearance to combustibles. If you are installing a horizontal or vertically insulated fireplace system, and you need a way to connect your PelletVent Pro piping to your heating appliance, this adaptor can help. By offering a 3 inch pipe opening, this adaptor can help connect most pellet or oil appliances to PelletVent pipes without the need for additional materials. This adaptor is black, so it blends in with the other piping, and it can easily be attached to the flue collar for easy use. If you are passing your ventillation system through your ceiling, this firestop is a necessary component of your vent system. With this spacer between your piping and the walls, you can get the clearance that you need to keep your vents away from the combustibles in your home, and you can keep your home safe from accidental fires. Each kit comes with a support clamp that helps with the installation, and this firestop is designed to fit with other PelletVent Pro products. Have you recently purchased a new wood-burning stove and also have a cathedral ceiling? If so, you have probably noticed the difficulties that arise. This Dura-Vent Cathedral Ceiling Support Box is the solution. Without it, it is much more difficult to install piping in a cathedral ceiling. It is of a stylish black color. Installation is simple: clamp and trim are included. This Support Box fits pipes with a 3" inner diameter and includes a limited lifetime warranty. Easily maneuver your piping around obstacles with PelletVent Pro's connection tee and cap. This tee will create a 90 degree offset for vent piping and the branch swivels for easy alignment with adjoining pipes. You can easily connect two different appliances to a single vent and efficiently vent you pellet or corn-fueled stove or insert. The connection tee is equipped with laser-welded seams, a secure twist-lock connection, and cap. It is UL listed and requires a 1 inch clearance to combustibles. This connection tee comes with a cap. It is made for use with pellet stoves and has a three inch inner diameter. It comes in black to match other Dura Vent ventilation products. It is part of the system to vent pellet and corn fueled stoves and fireplace inserts. This connection tee creates a 90 degree offset for the vent piping system. The branch fully swivels making for easier installation and alignment. The tee features a limited lifetime warranty. Improve the quality of your PelletVent Pro installation with the aid of this supportive wall strap made by Dura-Vent. Specifically designed, this PelletVent Pro strap is made for wood pellet and oil fuel stoves and inserts. A high quality product with a limited lifetime warranty, the inner wall is created of .012" stainless steel with an outer wall of .018" welded galvalume outer wall. Adjusting to provide 1-3 inches of clearance, this PelletVent Pro strap fits 3" diameter vent pipes. A house shield protects the outside of your house from the damage of blower discharge. This house shield by PelletVent Pro allows your house to be protected with a 12 inch by 12 inch shield. It is designed to fit into any PelletVent Pro vent pipe that has a 3 inch inner diameter. Along with protecting the outside of your house from damage, it is also backed with a limited lifetime warranty to offer peace of mind. Even the most soundly constructed vent systems will deteriorate without proper weather protection. That's why this Round Horizontal Rain Cap is a fantastic addition to your horizontal PelletVent Pro vent termination. Made of durable stainless still, this rain cap provides phenomenal defense against snow, rain, and wind. This item features laser-welded, double wall pipe with an inner wall of 0.012" stainless steel and a 0.18" laser-welded galvalume outer wall. A lifetime limited warranty is included with this Rain Cap. PelletVent Pro has designed their Dura-Vent Attic Insulation Shield to be a durable solution when it comes to installing a fireplace into your home. Is is specifically designed for Vent Pipes that have a 3 inch inner diameter, helping to give you peace of mind that your attic is protected from the heat and smoke that passes through your chimney so that you can sit down, kick back, and relax in front of your new fireplace unit. Never leave your chimney for finished if you have not installed the flashing that it needs! In the case of Dura-Vent PelletVent Pro Adjustable Galvalume Roof Flashing, you have a product that was created specifically for Vent Pipes with a 3-Inch Inner Diameter, giving to them the necessary sealing to insure that they will stay water tight and that your chimney can function properly without causing any problems to your home. Designed to be used on flat roof tops chase enclosures, and masonry chimneys the Dura-Vent PelletVent Pro cone flashing makes it easy to protect your PelletVent Pro through roof venting system. Constructed of durable galvalume; this cone flashing fits vent pipes with a 3 inch inner diameter. It has a 3.75 inch opening, is 17" W x 17" L x 11" H that is usable with wood pellet and oil fueled stoves. It is also provides a limited lifetime warranty. During a strong storm, the last thing that you want is for your flashing to break off and flood your home. The Dura-Vent Storm Collar creates a weather resistant seal between vent piping and flashing in your home to ensure than you and your loved ones stay dry. Made by the experts at PelletVent, you can rest assured knowing that quality care and construction went into the Dura-Vent Storm Collar. Keep your home safe from rain and weather damage with this item today. Optimal weather protection is essential for the longevity of your chimney system. This vertical rain cap by Dura-Vent provides that protection-specifically for PelletVent Pro wood pellet stoves and oil fuel. This rain cap is intended for use with vent pipes that have a 3 in. inner diameter, and is used in vertical terminations only. Made of durable stainless steel construction, this 6 in. high rain cap is laser welded and double wall with an inner wall of .012 in. stainless steel and a .018 in. welded galvalume outer wall. Venting a pellet stove can be a pain--but Dura-Vent's here to take your headaches away. If you need to transition your pellet venting to another diameter when installing PelletVent Pro pipes, this 4-inch diameter tee adaptor with increaser makes it easy. This adapter and increaser features durable galvalume construction and exterior finish. It features a 3 inch inner diameter branch section. Make sure your pellet stove is vented right with this handy tee adaptor with increaser from Dura-Vent. This DuraVent PelletVent Pro 4-inch diameter tee adaptor with increaser is an invaluable component in your PelletVent Pro system. It features a 3-inch inner diameter branch section. You'll find this component is great for transitioning between two different diameter of PelletVent Pro pipes. If you're installing a pellet stove, you won't find better venting components than you will from the brilliant folds at DuraVent. Choose this system for a safe, durable venting solution for your pellet stove. Four inch vent pipes will connect to three inch appliance outlets with this three to four inch increaser by Dura Vent. This increaser is designed to work with venting systems for inserts and stoves using oil fuel or wood pellets. It can withstand flue temperatures of up to 570 degrees Fahrenheit. The inner wall is .012 inch stainless steel and the out wall .018 inch welded galvalume. It is available in an attractive black color. This appliance adapter is designed to increase from three inch to four inch. This allows your four inch vent pipe to attach to your three inch appliance outlet. This adapter is part of the Pellet Vent Pro venting system created to use with stoves and inserts that burn pellets and oil fuel. The vent system produc s are made to withstand temperatures of up to 570 degrees. The appliance adapter features a limited lifetime warranty. You may have heard that a gas-burning stove is the way to go if you're looking to find an efficient and environmentally-friendly secondary heat source. But the truth is, there's an even better option. This US Stove Corn and Pellet Burning Stove with Legs offers the same kind of efficiency and convenience as gas-fueled appliances, but with a heating capacity usually only found in wood-burning models. Really, it's true. Just look at the numbers. This US Stove Corn and Pellet Burning Stove with Legs can use anything from compressed wood pellets to cherry pits to warm a 2,000 sq. ft. space. It produces up to 52,300 BTUs of heat per hour and features a 78% efficiency rating. Don't let yourself get tricked into thinking that you have to buy a gas appliance in order to add economical heat and an inviting ambiance to your home. This US Stove Corn and Pellet Burning Stove with Legs is more powerful than your average gas stove and, because it uses what are essentially waste products as fuel, will cost you far less to operate. And, when it comes right down to it, why would you want to spend more money on gas? Isn't your high gas bill what inspired you to get a wood stove in the first place? How long does a 60lb bag burn? What is the measurement from floor to flue? Feed speed is adjustable on this unit and it has 5 heat levels as well. A 60 pound bag could last anywhere between 60 hours (lowest setting) to 12 hours on it's highest. The flue outlet height is 12" from the floor on the hearth legs model. Does this stove have a thermostat for temperature settings? As standard, the unit uses a heat range setting that controls the amount of fuel that is fed to the burn pot. After learning the stove, an approximate temperature can be determined, based on the heat range setting you select. For more accurate operation, the unit can be equipped with a wall thermostat. The installation was very simple using the supplied DVD. In no time at all I had this stove up and running. The medium setting keeps my mid-sized home nice and warm. The reviews were very helpful to me in making my selection, and I couldn't be happier. This stove will do everything it says and then some. We burn wood pellets mixed with corn; 65 to 35 ratio, and that's it. Our total utility bill in the winter being total electric and using this stove is less than 225.00 per month on 1800 sq. ft. home. In the chilly Midwest winters of late, it is less than half of others around me. I have tried rice and soy beans. Rice burns fast but hot, soybeans are even hotter but are very oily. Use a good hardwood pellet that contains no pine wood with clean dry corn and you will have a lot of heat on the lower settings. You can control the room fan, the firebox fan, feed rate of fuel, and the rate that the firebox agitator turns, seperately. I can get a blue flame about 2 to 2 1/2 inches above the agitator! Yet it is cool to the touch every where but the glass & door,the flue pipe is on the warmer side but does not burn unless you hang on to it past all reason, so it is very safe around pets and most children knowing what hot is and what it will do. I can't begin to say enough about the agitator. If you don't have one trying to burn grains in any amount, you WILL have a clinker to remove at least daily, depending on the rate of fuel feed. You only need to clean a US Stove with the above fuel mix once a week, takes less than 5 minutes to do it too. The more grain you use the more often you will need to clean. If you are thinking of a pellet/grain stove, then look no further. There have been ZERO problems in the 3 years we have owned this stove. We have owned other pellet stoves and either sell them or leave them behind in the house we just sold. Every one that knows we have a US Stove Multi Fuel Stove comes to check it out and so far 3 more have been sold! I amsaving a lot of moneyon fuel to heat my home. I've had this stove for three years and I am sure that I have saved more money than what I paid for it. It is very easy to care for and operate. I do wish it would have a thermostat and self ignitor, but even so, it is a really great stove. I love the fuel savings! I ran this stove all season long and it heated my home so well I never needed to use another heat source. I saved a bundle of money in fuel costs. I've had experience with several types of pellet stoves for six years or so. Not to long ago we installed this stove downstairs in our house, which is a raised ranch floor pattern. It keeps the downstairs really nice and warm, even when it gets down below 10 degrees Fahrenheit outside. It keeps the upstairs pretty warm too, around 70 degrees, which we can live with. Altogether we're using the stove to heat over 2400 sq ft of house. Just be aware that the design of the hopper/augur mechanism allows about a quarter of the pellets to stay inside the hopper and not burn. So it's "out of pellets" even when it isn't out of pellets. As long as you're aware of this and scoop the pellets to where they need to be, it works fine. Highly recommended stove! Keep the burnpot clean and the stove will run its best. The noise level of this stove's fan is similar to that of an air conditioner. An overall good stove. Installing the stove was very simple, and it seems to be operating without difficulty. It does need some tending and tweaking as is true of any pellet stove. It stopped working once, but I think that was because I had wrongly adjusted the air intake to let in too much air. My main complaint is its heating capability. I have a big wood stove heating the majority of my 2500 square foot older home, and I had planned for the pellet stove to heat the remainder. Unfortunately, it can't seem to keep up with the cold and only manages to maintain temps in the low 60s. I don't think it is capable of heating the area listed in its specifications. It is still a good stove for the price that I paid, but it would be nice if provided a little more heat. I am so thankful for this great, quality stove. The installation for this stove was very easy with the step by step installation video. What a great help! I am very impressed with this stove's great looks and ability to warm my home on chilly nights. About a year ago we bought our first pellet stove. It worked great, but we have it in our family room fireplace, and its kind of shut off from the rest of the house. So weve bought a second one and have it in the living room. Keeps us nice and warm. Love the product, well worth the cost! This stove is keeping my 1500 sq/ft home verycomfortable and warm.It is my first pellet stove and I am burning different kinds of fuel with no problems. The grain can be burned without cleaning it, and the automatic settings make this stove easy to operate and a great choice for everyone. This stove was easy to install and I would highly recommend it. This stove only took a couple of hours to install. It heats our medium size house very well even though we keep it on the lowest temperature setting while we sleep. We are very happy with this product and the customer service department. We are giving this multi-fuel stove an A+ review and hope many others would give this product a closer look. Before I get to praising the stove, let me give you a couple tips. 1. The units not hard to clean (especially if you do what I do, have your husband do it! ), but be sure you get rid of all the ash when you clean it so theres no risk of fire breaking out where its not supposed to be! 2. I suggest you go ahead and order replacement parts ahead of timelike the vermiculite backer board. Then if yours goes kaput, you dont have to wait to use the stove till another one arrives. OK, now the praising partweve had this for almost five years, terrific stove. Not only would I buy it again, I recommend it to my friends! If you don't like to burn gas, you will really love this stove. I like the fact that I can burn corn or wood pellets. To me it is more environmentally friendly. This stove puts off a lot of heat, and I am very happy with my purchase. I can't say enough about this great stove. My home is very warm and no more oil bills! This stove is keeping my northern Michigan home very warm. I just love how it is saving me money on my monthly fuel bill! The fan does a wonderful job in giving off a warm, constant heat to the whole house. If you want to save some money and live in a northern climate, this is the stove to buy! I rate this stove excellent after one day of use. With the heat on the lowest setting it is adequately heating the space at about one pound of pellets per hour. Weve had this stove for almost four yearsno problems with it yet! We use a 65/35 ratio65% wood pellets, 35% corn, and that works well for us. I tried soy beans and rice once. They were okaygot lots of heat out of both of them, but soybeans leave an oily residue. For best results get a good quality pellet made of hardwood (not pine!) and combine it with corn. Controls are nice on this modelyou can change the agitator rate, the room fan, the rate that the fuel feeds in, and the firebox fan. I like the fact that the unit doesnt got too hot to touch except for the door, so thats helpful if you have kids or pets around. I really love the agitatorwhat a great addition! Cuts down on the frequency of cleaning required and the time involved to do the cleaning. Overall, I am pretty happy with this stove. We have used it in our home in Maine for about six weeks. It was easy to install and very simple to clean. I really like the agitator and will make sure to have one in any other stoves I purchase. I did end up buying an anti-whistle kit. It really helps with the sound and should have been included with the order. Using the lowest presets makes for a very slow burn but dirty glass. The glass stays clean for nearly a week on the medium presets. I do like the glass though as it casts a nice amount of light. I think this is a good stove at a fair price, especially compared to the stoves of my friends. This past summer, I bought this stove and installed it. Now that it is winter, I am very happy with it. I have an 1800 square foot Cape Cod, and the stove easily keeps it between 68 and 70 degrees. I add pellets each day and clean the stove weekly. The blower is a little loud, but the unit runs really great. I am heating a 2300 sq/ft one level home in Vermont and this stove has heated the entire house. I am really happy with its performance after a year, and also happy with the technical support I received. When I had a problem with the room blower making a high pitched noise, the tech support sent me the part I needed to eradicate the problem. It's more than I could have hoped for. This stove looks very nice in our rustic style home. We just installed it recently, but already we love how it is heating our large, open living area. Some people have complained about the noise of the fan, but we find the low setting to be very quiet and the nextfan settingvery tolerable. 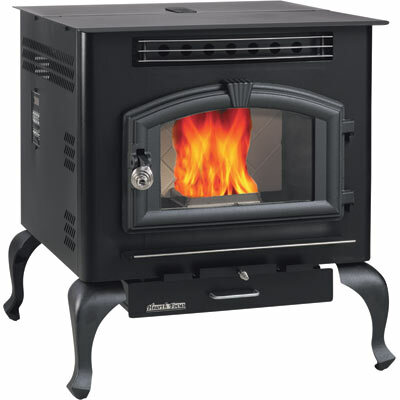 We have no complaints about this stove, and appreciate the great price and fast delivery. I had this unit installed by a professional and he seemed to think highly of the unit's functionality based on its size. We've had this for several years now and it has always worked well. I achieve maximum heat through the use of the blower and mixing fuels, corn and wood pellets. It comes with a very helpful manual.